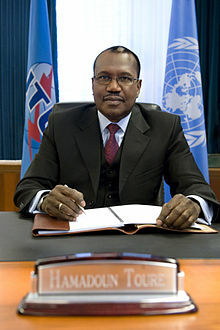 From 2007 to 2014, he served as ITU’s Deputy Secretary-General, where he effectively assisted the ITU Secretary-General, in close cooperation with the other elected officials of the Union, to manage the implementation of the ITU Strategic Plan and the operations of the ITU Secretariat, in particular with a view to increasing the transparency and efficiency of the organization. He was responsible for implementing important innovations including the promotion of a new category of membership open to the global academic community, internal efficiency measures such as the move to a near-paperless work environment, the increased use of remote participation systems, and measures to increase revenue from sales and cost-recovery services. In addition, he focused closely on membership-driven priorities including maintaining and extending ITU’s commitment to accessibility, to multilingualism, and to broad multistakeholder participation in the work of the Union. Prior to this Mr Zhao served in the elected role of Director of ITU’s Telecommunication Standardization Bureau (TSB) from 1999 to 2006. During his two terms of office he spearheaded the introduction of new efficiency measures to improve ITU’s standards-making environment through fostering even closer cooperation with industry members, while strengthening the promotion of ITU’s leadership in global ICT standards development. From 1986 to 1992, Mr Zhao was a senior staff member in the then CCITT, and from 1993-1998 in TSB. Among his responsibilities as Counsellor for ITU-T Study Groups, he was Coordinator for cooperation with other international technical bodies, including ISO and IEC. Before joining ITU, Mr Zhao served as an engineer in the Designing Institute of the Ministry of Posts and Telecommunications of China, taking an active role in his country’s expert meetings on telecommunication standards and national plans, as well as participating in CCITT Study Group meetings as a Chinese delegate. He contributed important articles to a number of prestigious Chinese technical publications, and in 1985 was awarded a prize for his achievements in science and technology within the Ministry of Posts and Telecommunications. As ITU’s 19th Secretary-General, Mr Zhao is committed to further extending ITU’s community by encouraging more industry members and academia from around the world to join the ITU family. He has also initiated a more open-door policy to welcome other stakeholders and partners, as well as promoting the greater involvement of small- and medium-sized enterprises in the work of the Union. Read his Acceptance Letter for Patron of Global Cyberlympics.